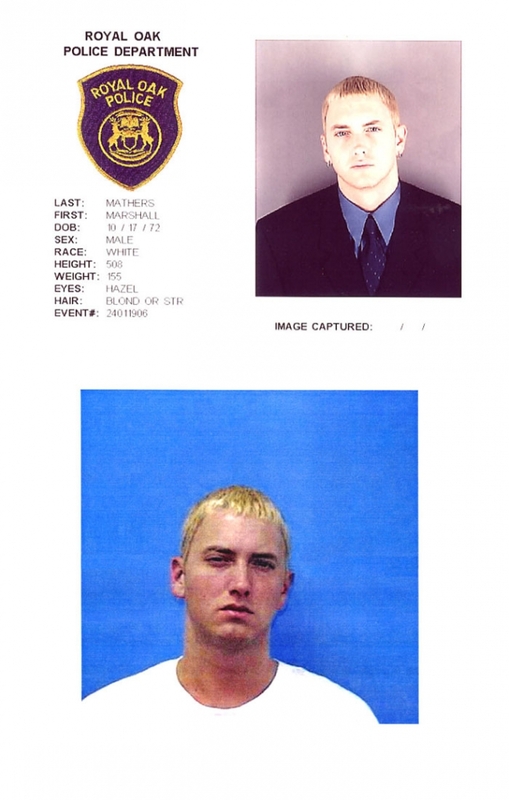 Marshall Mathers, III (aka Eminem) was arrested twice in June 2000 on gun charges in Michigan, and was hit with probationary sentences in both cases, one in Royal Oak, the other in Warren (above you'll find mug shots from both those arrests). The rapper was nabbed by Warren cops for carrying a concealed weapon and assault after fighting with a man he saw kissing his estranged wife Kim outside of a club. He also got popped for brandishing a weapon during a parking lot beef with members of the rival rap outfit Insane Clown Posse. Submitted by Slothy on Sun, 2010-12-05 10:57. Submitted by franktherabbit on Mon, 2010-11-29 13:41. Why he look like he forgot his glasses on both shots?